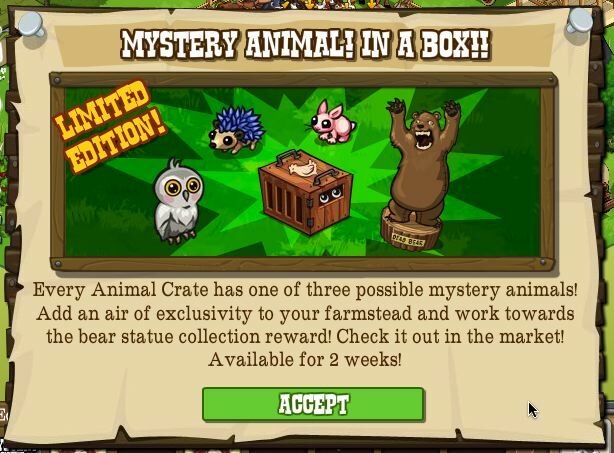 A new Mystery Animal crate mysteriously appeared in FrontierVille, bringing with it a chance to add three new, exclusive animals to your homestead. If you're in the mood to try your luck, you can buy a Mystery Animal box in the market for 50 Horseshoes (roughly $7) and open it up to find an owl, porcupine and a pink rabbit inside. If you collect all three, you'll will be able to brag about it with your new Dead Bear statue. The Mystery Animal crate will only be around for a limited time, so all of you collectors out there should move fast before the crate disappears from the Market. (Though, judging from FarmVille's limited edition items, it's more than likely that these mystery animals will return again at a later date). 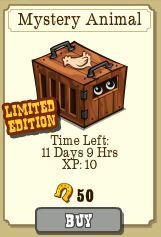 Do you think the Mystery Animal Crate is worth the price? How many tries did it takes for you to find all three animals?